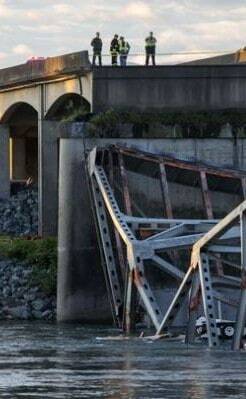 One in nine of the nation’s bridges are rated as structurally deficient. The average age of the nation’s 607,380 bridges is currently 42 years. to eliminate the nation’s bridge deficient backlog by 2028, we would need to invest $20.5 billion annually, while only $12.8 billion is being spent currently. And that’s just infrastructure. We have other problems that have gone unaddressed since … well, since the big corporations took control of the government. We have a number of serious problems but many people remain unaware that they even exist, or don’t feel any urgency to fix them. (Or are told they are hoaxes, like the oil-company campaign to convince people that climate change isn’t a problem.) But what if these problems were put in front of people’s faces every day? Suppose every time you watch the news there was a little box in the corner of the screen labelled “Americans Killed By Tobacco Today” with a counter that was ticking up from zero to the end-of-the-day total of 1213? (Yes, it is that many.) What if it also had a counter for this month (36,916), this year (443,000). How would this change the way people understood the day’s news? Suppose whenever a talking heads appeared on the air to say that government employees (teachers, police, etc) are paid too much or their pension should be cut or taken away … suppose that under their name and affiliation it also showed how much they make each year? Suppose there was a counter showing how many bridges collapsed this year, how many more dams were declared unsafe, how much faster people can travel between cities on China’s HS rail? Would things like these help adjust the priorities of the country?